scored four double centuries in Test cricket. Some interesting similarities between Sunil Gavaskar and Sachin Tendulkar in test cricket. Both have scored four double centuries in Test cricket. Both have scored two double hundreds apiece at home and overseas. Both registered their 34th hundred in their 119th test match . Gavaskar scored 18 centuries abroad, while Sachin has posted 19 so far. - Both scored hundreds against all the Test-playing nations of their era. Gavaskar achieved triple figures against Pakistan, West Indies, England, New Zealand, Australia and Sri Lanka, the Test nations of the time. Zimbabwe and Bangladesh were still to attain Test status and South Africa had been isolated on account of its Apartheid regime. Tendulkar on the other hand got the opportunity to play Test cricket against these three countries besides the six mentioned above, and scored centuries against all of them. - At the end of his 119th Test, Gavaskar had amassed 9,748 runs at an average of 51.30 while Sachin at the end of his 119th Test has an aggregate of 9,843 runs at a rate of 57.56. Remarkably similar aggregates. 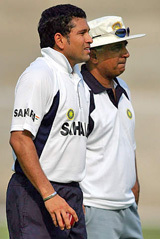 Gavaskar holds the distinction of scoring the maximum Test tons ( 33 ) as an opening batsman, while Tendulkar has scored the maximum number of Test hundreds ( 29 ) at the number four slot .